If you’ve started looking for a home – along with a real estate professional to help you – your agent may ask you to sign a Buyer’s Representation Agreement. 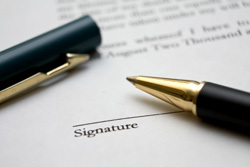 What is a Buyer Representation Agreement? Why should you sign it? A Buyer Representation Agreement is a legal document that formalizes your working relationship with a particular buyer’s representative, detailing what services you are entitled to and what your buyer’s rep expects from you in return. While the language used in the document is formal, homebuyers should view it as an important and helpful tool for clarifying expectations, developing mutual loyalty and most importantly, elevating the services you will receive. 1. Receive a higher level of service. If you’ve formalized an agency relationship with a buyer’s rep, you can expect to be treated like a client instead of a customer. What’s the difference? Clients are entitled to superior services, relative to customers. While the details vary from province to province, and from one buyer’s agent to another, you can generally assume that being a client means that you’re formed a fiduciary, or agency, relationship with your buyer’s rep.
2. Get more without paying more. In almost every case, home sellers have already agreed to pay a buyer’s agent commission. If they haven’t, you can ask your buyer’s rep to avoid showing you any such homes. Or you can still view the home, knowing that you’ll need to factor your agent’s commission into any offer you may write. While buyers rarely pay real estate commissions, this is an important detail you’ll want to discuss with your buyers’s rep and clarify in their representation agreement. A Buyer’s Representation Agreement clarifies expectations, helping you understand what you should and shouldn’t expect from your buyer’s rep and what they will expect from you, which usually centres on loyalty. 4. Agency relationships are based on mutual consent. While most representation agreements specify a time period, they can be terminated early if both parties consent. Most buyer’s reps are willing to end the agreement early if the working relationship isn’t going well. 5. Strength as a team. When you and your buyer’s rep work together within a formalized agency relationship, you have created a team dedicated to helping you achieve the best possible home-buying experience. As an Accredited Buyer’s Representative, I have gone through additional training and I have proven experience representing buyers. See how I can be an asset to you when you’re buying a home. Part 1: Why Do I Need A Buyer’s Agent to Purchase a Home?